The RFII concealed sprinkler: Suitable for many applications where aesthetic design is of paramount importance, the concealed sprinkler offers the highest quality fire protection with low visual impact. The RFII concealed sprinkler comprises a flat cover plate, which is soldered to the retainer at three points and detaches at a pre-set temperature according to the necessary requirements and system settings. The sprinkler deflector is supported by the guide pins, allowing the head to drop down to its operational position. 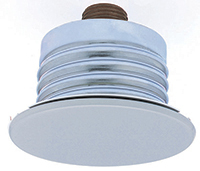 Based on a two-piece separable assembly design, the RFll sprinkler can be installed and pressure tested prior to the installation of the suspended ceiling or finish of a fixed ceiling. Designed for use in automatic sprinkler systems in accordance with standard installation rules, the RFII concealed sprinkler benefits from fast-action thermal sensitivity to provide a quick response and extended coverage rating up to 20 feet by 20 feet. UL and C-UL listed for use in light hazard areas, the sprinkler operates with a discharge coefficient K-factor of 5.6 and a maximum working pressure of 175 psi / 12.5 bar. In addition, for ongoing building maintenance, the design permits the removal of ceiling panels for access to building service equipment without needing to first shut down the fire protection system and remove the sprinkler heads. mechanism from direct view, it is possible to integrate the RFII sprinkler into a new or retro-fit scheme, without impacting on the overall design. Visit www.tfppemea.com to find out more about Tyco Fire Protection Products’ sprinkler technology.